Beautiful Landscapes and Weather, people should spend more time outdoors! Former coach and school teacher Rob Wenzel is passionate about people and quality time spent outdoors, which led him to start A New Creation, LLC. Thanks to the climate in the Tucson area, there is no shortage of sunshine, and Rob believes that beautiful landscaping is the key to getting people outdoors to enjoy it. Let Rob and his dedicated team help you create the outdoor space you have always imagined, so you and your family can fully enjoy the sunshine and scenery of your Southern Arizona home. Browse our collection of recent projects to see why our team of landscape designers have a reputation for success. 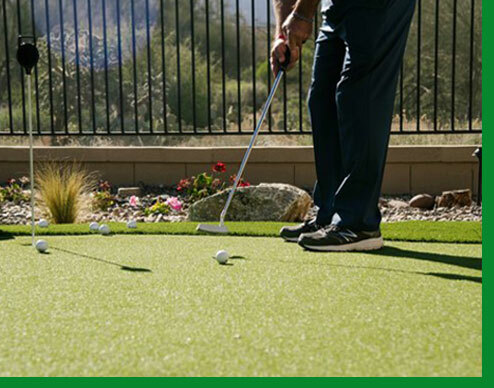 What could be more fun for your outdoor space than your family’s own putting green? 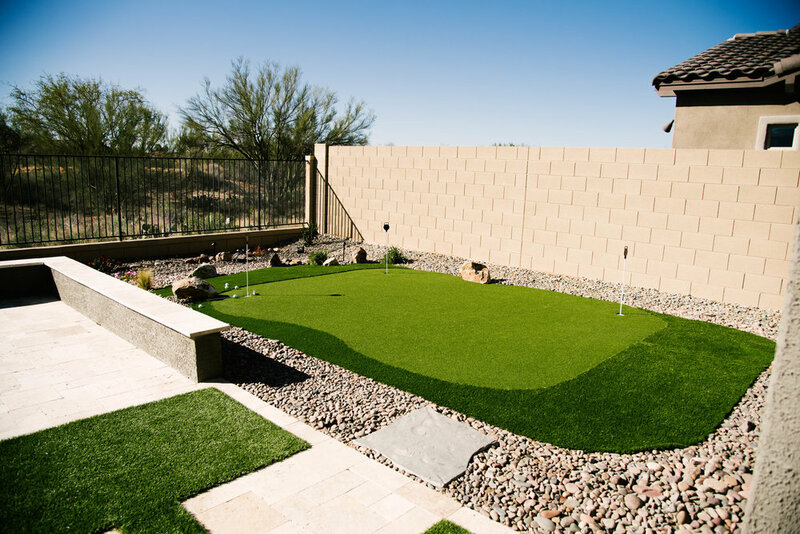 Putting greens, as well as turf walkways, make your outdoor area fun, functional, and inviting for family and guests alike. Create the perfect outdoor space with a fire pit and paver patio. Dine outdoors, have a pseudo campfire, or prop up your feet around your fire pit while relaxing with a glass of wine on your paver patio. Water is at premium in Arizona, but that doesn’t mean you have say goodbye to your dream of having a green lawn. Turf lawns look lush and natural with no water demands, and incorporating raised planters will complete your landscape design. Your living space doesn’t have to end at your door. With outdoor dining and entertaining spaces, you can spend more time with family and friends outside, thanks to a combination of pavers and turf in your chosen design. Our skill, honest work, and creative vision make us the people’s choice for backyard makeovers. Our team always shows up on time, and we communicate our plans with you every step of the way. Our work speaks for itself. We’re committed to unbeatable quality and attention to detail in every project, no matter the size. We’ll ensure that our plans fit your vision, and our job won’t be done until you love your outdoor space. When your outdoor space is under construction, it doesn’t have to look like a disaster zone. Our team cleans as they go, and they work in an organized and efficient way, so you don’t have to deal with the stress of a messy space. Are you tired of hiring people who don’t show up or don’t finish the job on time? Our team works on time and on schedule, without sacrificing quality. We will keep you informed at each step, so you always know what is happening with your project. There’s more to designing an outdoor area than just the appearance. Without proper planting techniques, the beauty of the finished results will only be temporary. Trust an experienced landscaper to create a gorgeous yard that will thrive for years to come.